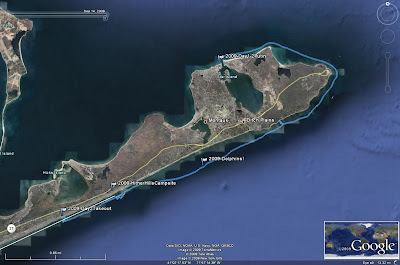 Kayaking Around Montauk Point, and Dolphins! A group from Sebago is doing a five-year circumnavigation of Long Island. I missed the first year of the paddle, but joined last year (write up here), and by the end of last year's leg of trip, the group had made it from our clubhouse in Brooklyn out to Georgica beach in East Hampton (where I used to hang out back in the late 1980's while working for Bran Ferren). 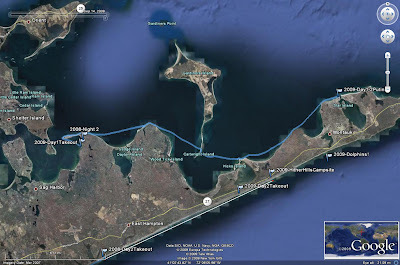 We ended up losing a day last year due to severe weather, so the plan this year was to try and make it from East Hampton around Montauk point and up to Orient Point (see draggable/zoomable Google map here). I always thought covering that distance in three days was pretty ambitious, especially with September weather and since this leg covered the crux of the trip--rounding the completely exposed Montauk point. In addition, this is the most beautiful part of Long Island, and the part that was most interesting to really look at and experience. The waves looked manageable, but the winds out of the east were just crazy strong, and I certainly didn't feel comfortable heading out with a group of nine into those kind of conditions. And so, that left us with only one choice: BOWLING! We had a nice lobster dinner at the campground that night, and then the next morning the surf was much better. But we decided, due to the tide situation, that we would put in at Montauk harbor once again, and paddle clockwise around the point. This had the benefit of getting around the point (about which I had always been nervous) while we were all still fresh. And we made it around the point! We passed Montauk town, and I thought I saw a fin up in front of me, and it was! Two schools of dolphin were fishing right around us. It was mesmerizing, they swam along with us for probably 20 minutes. The dolphin eventually chased their fish somewhere else, and then, gradually, the wind shifted from the north to the southwest (in our faces), and got quite a bit stronger. Our progress (especially mine) was slowing, and after about 17 miles we made it back around to Hither Hills, our campground. There, a couple group members were having back pain and decided to make up the remaining distance to East Hampton at some other time. I was feeling pretty crappy myself, but I really wanted to complete the south fork part of the trip and was willing to keep pushing on, albeit slowly. We rafted up and I jumped overboard to stretch out (ironically, it's my legs that kill me on these long trips--being crammed into that cockpit for long periods just kills me). At 20 miles, with 9-10 still to go (we lost mileage rafting up) we did the calculations and realized that we would not be able to get back to East Hampton before sunset. And surf landing in the dark is not something I would want to attempt. We were right at the eastern end of Napeague State park at that point, where there were still roads and some beach access, so we decided to call it a day at that point. We also conveniently pulled out right near the famous Lobster Roll, so we had dinner there and headed back, and it took me a couple days to get everything dried out. Personally, I'm not disappointed that we didn't make it all the way back to East Hampton, since that means I have yet another excuse to go there and paddle in the ocean. We completed the most difficult part of the trip, and, most of all, had a good time. So maybe it will take six years to get around--who cares? Thanks once again to Steve for leading, and special thanks to our indispensable ground crew of John, Linda, and Cody! Many more geo-tagged photos here. My writeup for the 2010 segment of this trip here.